Remember that thread mentioning JKHub a while back? Well, you might've noticed a weird bar popping up at the top of the site. I figured I'd explain what's going on. It's the JKHub Bar. Map Forge is part of a network of websites supporting eachother as well as the Jedi Knight Hub. It was installed here in cooperation with Darth Arth and Mrwonko. The purpose of the bar is to easily provide the latest Jedi Knight related news, and to support the rest of the community. We hope to encourage people to visit websites they may never have heard of, and to let them know if anything important happens. The reason you're seeing this bar now is because JKHub is opening up today. I've probably mentioned the JKHub project several times to most of you. JKHub is an attempt to create a central website for all things Jedi Academy and (to a lesser extent) Jedi Outcast related. Because of how many such projects failed over the years, we made thorough preparations: over 150 people have been working on JKHub for a full year, including several people from Map Forge. At the moment, we have over 1200 mods online (all with permission), several of which are exclusive to our site. JK3.in. You know how some servers let you connect to theirname.JK3.in instead of an IP address? That's us. 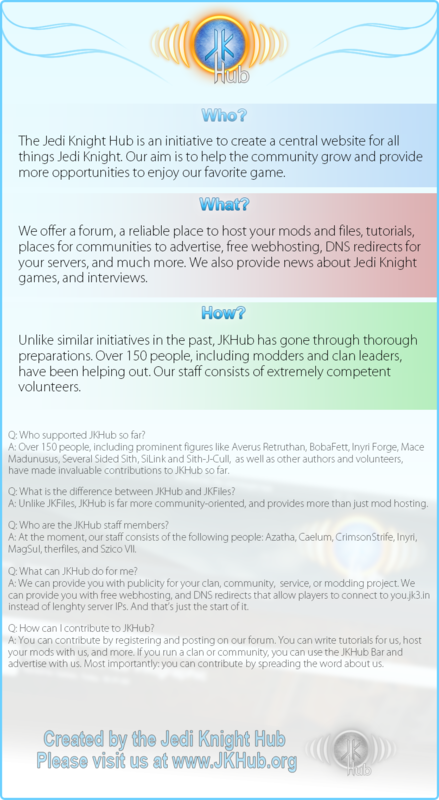 The JKHub Network, which Map Forge is now a part of. A lot of tutorials not available on any other websites. Always wanted to learn how to create skins or map mods? We have all the resources you need for that. And if we're missing something, you can add new tutorials yourself as well. A directory of links for communities to advertise at. Map Forge is listed in this directory. We'd love to get the people from Map Forge, as well as many others, involved in JKHub. Now that we've opened up, we'll be providing lots of cool stuff, including news, exclusive interviews, and possibly even ingame events. In short: we'd really appreciate it if you'd take five minutes to come check us out. And if you like the place, why not register and say hello?